Sometimes you just got to be a Rogue! 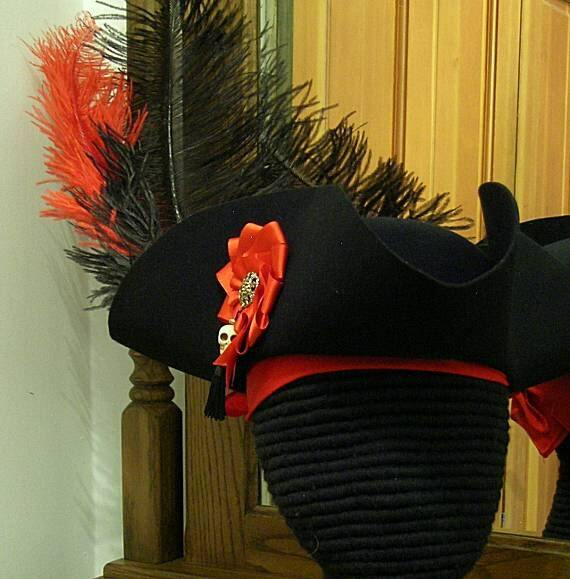 This pirate hat is a three cornered tricorn made from top quality felted wool. The edges have been trimmed even and the sides held up or "cocked" with narrow middy braid laces in an "x" shape. 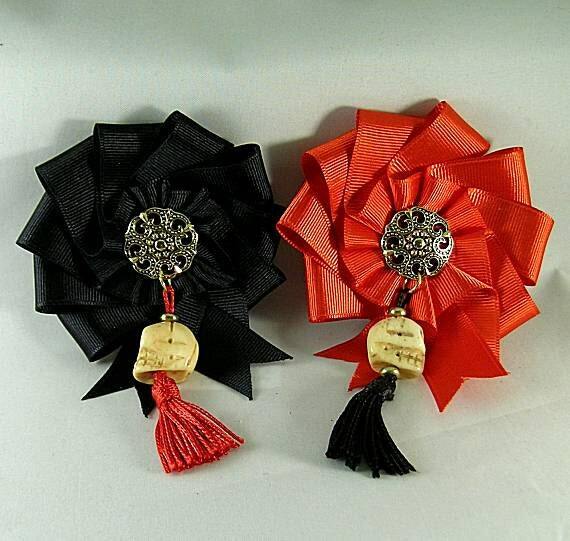 Also included are 2 ostrich feathers: 1 black and 1 red. If you want all black or all red, just let us know. Plus a FREE red bandana to complete the ensemble. If you want a black bandana, convo us. You can get everything all black just by asking! HISTORY: The tricorne or tricorn (three-cornered hat) is a style of hat that was popular during the 17th and 18th centuries. During that time period this general style were referred to as "cocked hats". At the peak of its popularity, the cocked hat (tricorn) varied greatly in style and size, and was worn not only by the aristocracy, but also as common civilian dress, and as part of military and naval uniforms. 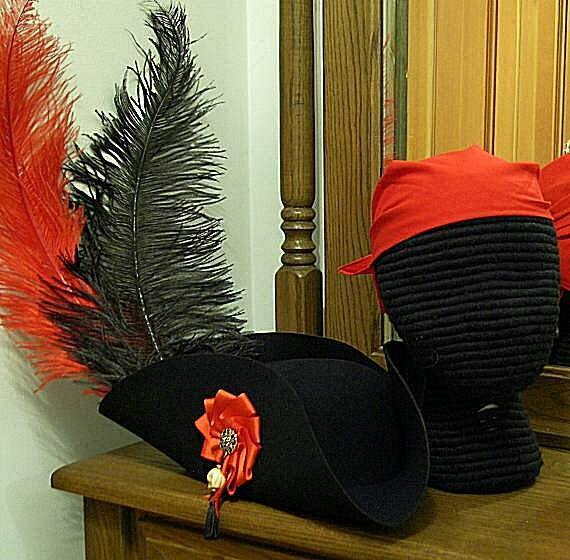 The tricorn appeared as a result of the evolution of the broad-brim round hat. By pledging (binding) the brims, a triangular shape was obtained. This shape was favored by Spanish soldiers and in 1667, war broke out between France and Spain in the Spanish Netherlands. During the subsequent military struggle, its use spread to the French armies. The style was brought back to France, where its usage spread to the French population and the royal court of King Louis XIV, who made it fashionable throughout Europe, both as a civilian and military wear. 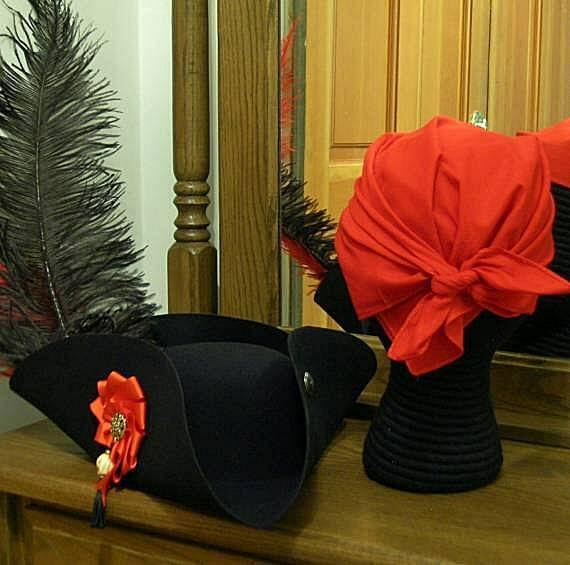 They remained one of the predominant European styles of hat throughout the 18th century. Another fabulous hat and cockade! This is my second hat and both have been spectacular. The cockade on this is so amazing and just right for the pirate look, and the hat fits like a dream. Shipping was fast and the hat was very well packaged. I couldn’t be happier and Palace Gallery is my go-to hat shop forever.